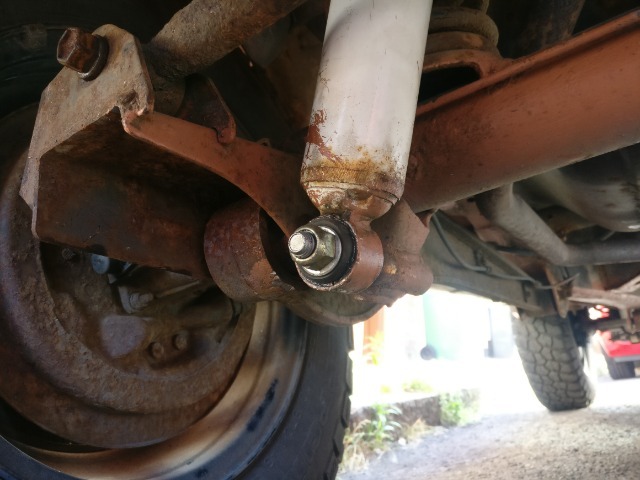 The rear lower bush had gone on one of my rear shocks and having purchased two new bushes it went into the garage today to have them done. On one side the bolt snapped. The mechanic told me he fitted a bolt into the hole and welded it in. 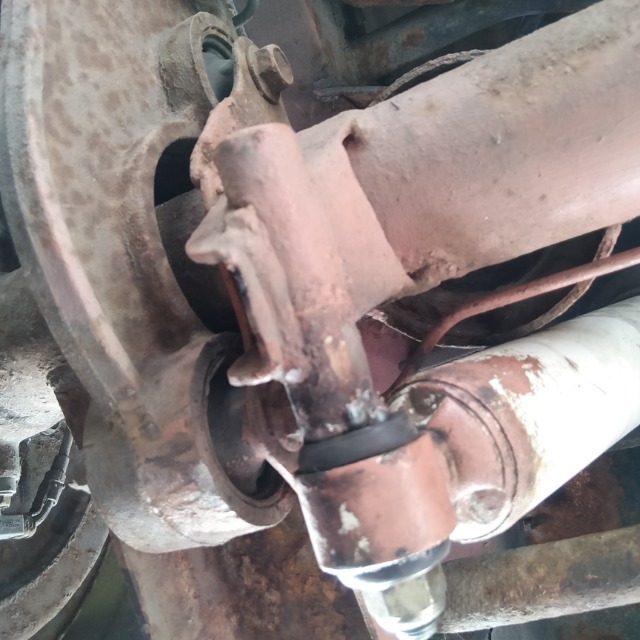 He said to change the shock in the future you would need to disconnect the panhard arm. I am not mechanical whatsoever but on looking o can't see how you'd actually be able to do this and also can't see how he managed to weld the bolt in with the shock in place? I'm not convinced it'll be a v strong fix. Also the shock is now touching the spring which suggests the shock mount is now shorter than it was before? I've attached some pics and would be grateful if someone could give me their thoughts! Welding does not look too good in that picture. It must be removable otherwise how did he get it on? Try undoing the nut and if it allows the damper to come off try getting the bolt welded better and also fit a washer so that the rubber of the mount seats against it and also help it to clear the spring. Thanks Mick. God knows what he's done! He specifically said about removing the panhard arm to remove it yet this wouldn't make any difference?! Tempted to take it elsewhere and have the boot drilled out and a long bolt through the whole lot. Shame he has shortened the bracket now though. As the original bolt has snapped (maybe the threaded section is still inside the mount?) he has cut the head off a bolt and put it in backwards into the mount(ing tube) and then spattered some weld round it. IF the threaded part of the original bolt has snapped off inside the mount that is about all he could have done? It’ll be a helluva job to drill through if the end of the bolt is still in there? A few washers on the new bolt mount next to that weld should space it out a bit? Last edit: 08 Aug 2018 21:23 by S200KYS. The person who did that should not be classed as a mechanic. He, She, They should of removed the broken stud and replaced with a new bolt. Not a difficult job in a fully equiped workshop, Or a poorly equiped back street garage. If that was not possible, you should of been contacted and informed of the problem, And asked if you were happy for them to do that third world bodge. It's been fettled just a tad. Jezz it's a small one man band who is usually very good- he did my engine swap with zero issues so normally is fine. I guess he just couldn't remove the broken stud?! S200KYS- thanks mate that explanation makes perfect sense now. There is some thread left on the bolt so hopefully space for a washer. Just hope it's strong enough to stand up to some off reading. Guessing if it fails I have it drilled through? Am im right in thinking he's removed some of the mount housing which is why the shock is now touching the spring. I would have though a new mount could be welded on though- it's basically just a threaded tube? It's difficult to tell from photos whether the mounting tube has been shortened? If the bolt sheared off on the mount then some heat and a left hand twist drill would have solved it in a few. To get that off now I'd be tempted to undo the damper at the top an rotate it down past the axle and then off the thread. I would definitely be sorting it out though because in the pictures I wouldn't put that welding against a speed bump never mind a pothole or green lane. Worst scenario is a replacement axle casing! Drill from the other side all the way through the mount and use a long bolt with some washers to space the shock away from the spring. I hope it's not a new axle!! I can't see why I can't get it drilled through if all else fails. I'll take it to a different garage and see what he thinks- he may be able to remove the new bolt and get the remains of the old one out. An new axle? Why even consider that? Worst case if the mount breaks or isnt straight is to have something new made. Shouldn't take long with a grinder and welder.